There I go again, letting the quote and photo speak for themselves. I should probably do that more often – we get enough good editorial content in the comments and discussion! But since many of our regular readers may feel as if they have come to know something of my family over the past year, I thought I might take this opportunity to share some of the back story of the photo that went with this post. 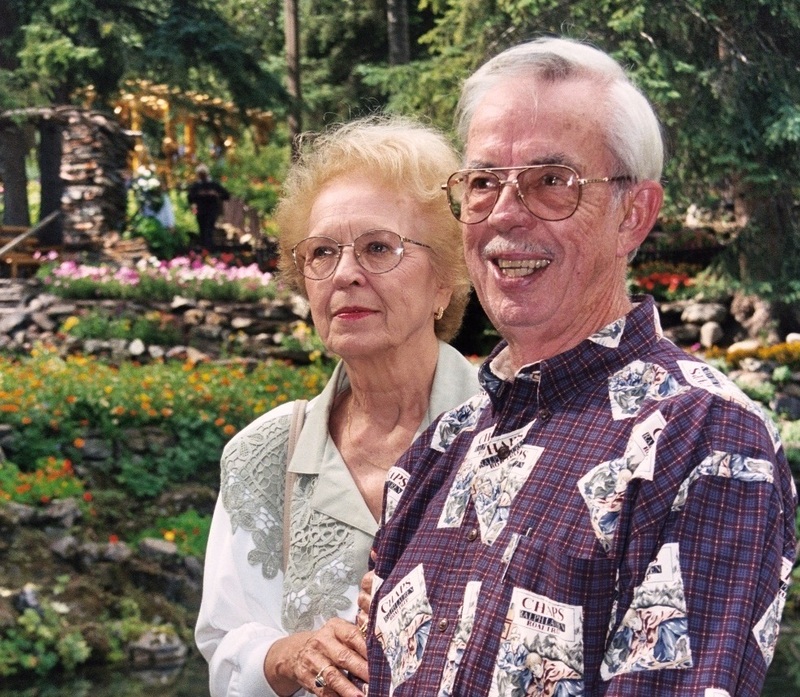 In 1999, my parents celebrated their 50th anniversary, and most of the family were able to travel to Banff to help them celebrate. My brother Al, his sons Aaron and Seth, my nieces April and Cami, and April’s husband Jeremiah were all unable to attend, but the rest of the motley crew had a great time being together and enjoying the stunning scenery. I’ll now bore you with a few photos snapped on that very brief but memorable trip – if you’d like to see them, scroll on! The original post with comments from one year ago can be seen here. 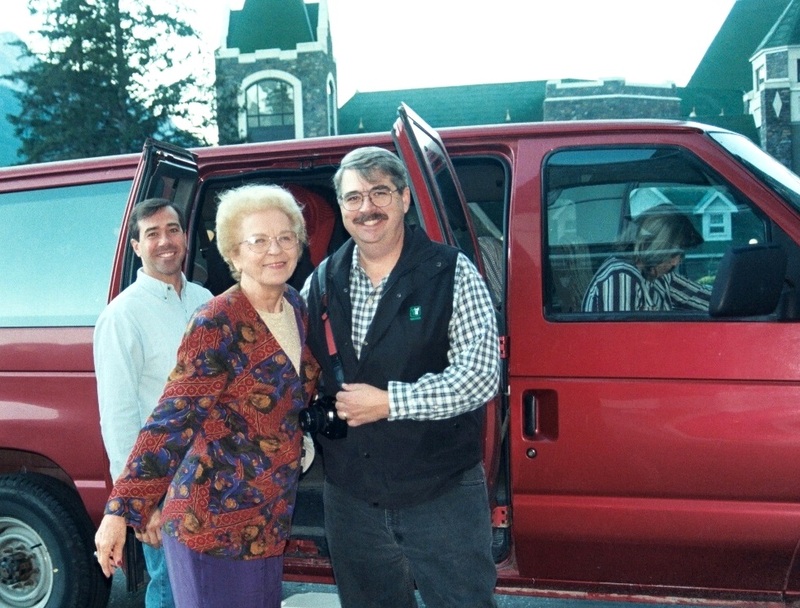 Jeff, Mom, Eric and Carla (in the front seat of the van) heading out to explore. 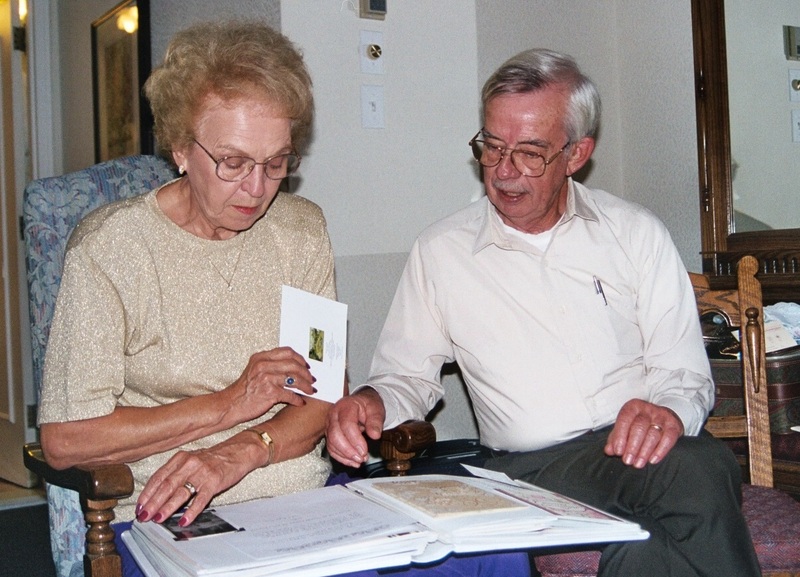 Mom and Dad enjoy an album of letters and cards from friends who wrote to congratulate them. Carla contacted people they had known over the past 50 years, and worked hard to put together the album. 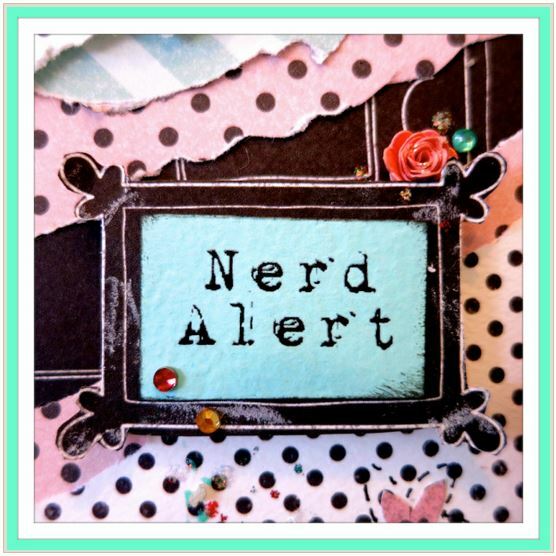 I learned some wonderful things about my parents from those letters, things I had never known! Carla, Jeff, Andy, George, Sherry, Drew, Mama, Daddy and Ryan at the anniversary dinner. Eric and I are taking the photos; Matt is to Carla’s left, not visible. I am SO glad you reposted this! I missed it the first time around. The photo’s and comments are magnificent. Thank you! It’s hard to believe I shot that photo through glass! I have never seen such a view from a hotel room, before or since. So glad you were there to see it with me! Every year when I put up the Christmas tree I remember that lovely visit when I hang the ornament you bought me there in town. My bad…I looked back and I had even commented the first time around. I was not considering that you added the other pics as part of the repost. Anyway, it was a great time! What a wonderful time that must have been. How lovely that you and your siblings took the time to do that for your parents. We were in Germany when my parents celebrated their 50th. My siblings were each in the middle of ugly divorces and the three of us did nothing for them. It was my plan to do something for the 55th but Dad died before they got that far along. Hindsight is 20/20 of course but I will always regret not coming home and doing something for and with them to mark that event. Amy, I too wish you could have been able to do something happy for them. I remember that awful time while your Daddy was so sick and you were flying back and forth from Germany, missing your family during the weeks in Colorado, and worrying about your parents while you were home with your family in Germany. In spending so much time with them you gave them during your father’s illness and death (to say nothing of the thousands of dollars in plane fares and the long hours at the hospital), you gave them something much more valuable than a party. I have always thought you were the most attentive and loving daughter. I know they were so strengthened by your presence. Thanks for sharing your family photos. So many seem like old friends now. Thank you, Ann. Jeff’s military career which has been such a blessing to us, has also kept us separated geographically from our families. I feel more connected to them through this blog, and it’s extra-wonderful to have others connected to them as well. My family has always felt to me like a lively “mob” (a term Daddy often used to describe us) where everyone was welcome. I grew up watching my parents host the most wonderful dinners and parties in our home, and having different visitors stay with us for extended periods of time. Their door was always open and I think their children were greatly blessed by the many people who spent time with us in our home. Back in the 60’s and early 70’s it was not so typical for people to have visitors from New Guinea, Brazil, or Iran in their homes, not to mention other types of “diversity,” but we enjoyed all these guests and more. I often look back and wonder in amazement how my Mama could put together such delicious multi-course dinners without benefit of a microwave or many other cooking gadgets, and with Daddy as her only “help” in the kitchen. She somehow pulled it off though, and by the time the guests were there she was at the table with them, laughing and enjoying it all. So I’m happy if my blog can bring back a bit of the family-style parties I remember so fondly! That is such an art to bringing a meal to fruition and enjoying your guests happily! Your parents seem like such a gracious couple. What a pleasure to see these photos. Good stuff, Julia. Thanks Sheila, I’m so glad you like the photos. I have to confess that “gracious” is not the first word that pops into my mind when I think of Mama and Daddy, and probably Eric and Carla would agree on that. However, they are two of my favorite people and I definitely feel lucky to say that there has never been a time when I didn’t feel surrounded by their love. Our family is far, far from perfect but my parents did a lot of things right. I still lean on them in the tough times and I feel so happy they are still with us. this is so beautiful! you look like both of your (beautiful) parents! thanks for sharing glimpses of your loved ones – you are so blessed!!! i returned home last night after being away for three months. i have a lot of reading before i’m up to date, but look forward to seeing what i’ve missed! Z, we have missed you here but I’m happy you have given us periodic updates on your travels at your blog. What an exciting life you lead! I just love your photos, especially those of the people you meet along the way. Thanks so much for popping back in at what is bound to be a very busy time for you. I appreciate your kind words, and yes, I’ve often been told that I look like both my parents, which I always take as a great compliment :-). Hey Raynard, you finally found a couple of songs I don’t remember. I might recognize them if I heard them, though. Let’s not talk about cleaning up the hard drive just yet…whenever I tell myself to get to it, I think “it’s more important to clean up the messes people can see” and I never seem to get finished with that! I have decided hard drive crashes are nature’s way of saying “TIME’S UP – this junk is OUTTA HERE!” 🙂 And since you mentioned Yoda, I simply have to upload a hilarious pic I copied from somewhere online (there was no attribution at the source where I got it) but I ought to have this framed and hung up in my house. As you may have guessed, I’m never short on comments and constructive advice, not to mention quirky advice and downright bad advice. So if you are good at sorting, you are asking the right person! You be blessed too! Yes, there have been other pics of him along the way, but this is a fairly typical one. Daddy, that’s what your children were saying to you and Mama at that party! Isn’t it an amazing blessing to be the parents of four OLD PEOPLE!??!! 🙂 Seriously, I hope you and Mama are still around to welcome the 5th generation to our family (No pressure, Jacob!) Thanks for being here with us. Thanks for sharing the pictures, I missed them before. I can see you and Eric in your mom and dad.Good looking family. You all take care and keep me up to date on Jeff. Hugs and love to all. Thanks Carolyn, I hope to be emailing an update on Jeff to you next week. Hope you and all your family have a wonderful holiday season coming up! Banff is such a beautiful place to celebrate a 50th Anniversary. 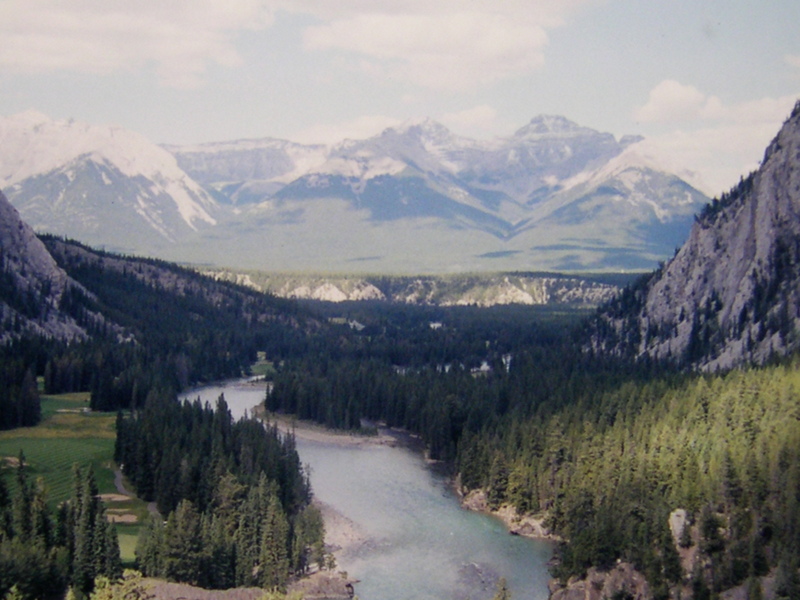 Some of my favorite memories are from a trip to Banff and also Lake Louise and hiking up to the tea room at Lake Louise. Your photos captured the beautiful scenery surrounding the hotel even though your visit was brief, I’m sure the memories will last a life time for all of your family. Now I’ve got to dig out my photos. Thanks for sharing. Thanks sam, we did have a great time in that brief weekend. We even made it to Lake Louise where we went canoeing in what must be the most perfect place for inexperienced paddlers such as I! The water is so still and gorgeous. I’m happy this brought back memories for you – enjoy those photos! Hey Rene, the link for the O’Jay’s did not come through – can you re-post it? Raynard, you know the old saying, “God only made so many perfect heads, the rest were covered with hair.” 🙂 Jeff agrees with you – he greatly overestimates his own hair loss but his philosophy is “when it’s gone it’s gone.” Although he has some “chemo fuzz” which I think is cute. It’s such a beautiful scene isn’t it, thank’s for traveling so far to visit too. Congratulations to your mom and dad, now celebrating 63 years together. That is just beautiful! We don’t get to the mountains more than a couple times a year as it’s gotten so expensive. Luckily for us, we have friends who built a home near Jasper and we’ve enjoyed their gracious hospitality. I just watched a news report about tourism being down considerably in Canada. The economists attribute it to the value of our dollar (almost par with the US). But it doesn’t take an expert to figure it out. I attribute it to the outrages hotel and restaurant fees in the Canadian Rockies. We stayed at the Jasper Park Lodge for my birthday one year. The guys enjoyed a day of golf (so pricey) while us girls enjoyed a walk (free). 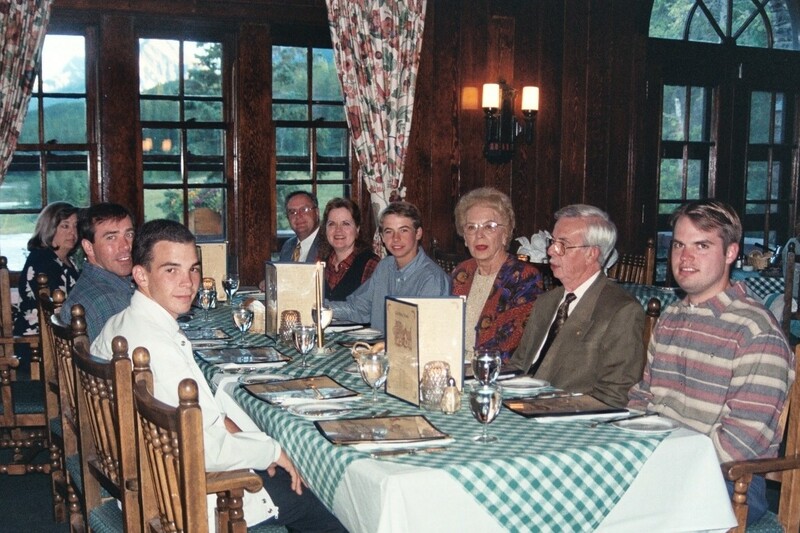 We dined at the lodge that evening and get this, the pasta dish I had (meatless) was $100.00. That’s insane, even if the views are majestic. Families should be entitled to enjoy it without taking that kind of dent out of their pocketbook. If they want to encourage visitors to stop and stay -vs- just drive through, it will need to be a more affordable destination. Yes, I remember feeling that way on our first trip to Yosemite over 20 years ago, and I’m sure it’s gotten worse. There were CROWDS there but I still thought everything was way too expensive. Maybe I’m just too frugal, but I agree that the prices are ridiculous. And the beauty of such places would be so helpful in lifting the spirits of so many people who have almost no chance of ever seeing them, due to expenses or other limitations. Plus the price of gas for driving to the relatively remote locations of many of nature’s showplaces will keep even frequent travelers away when there are other interesting places nearby. One reason we have never seen Yellowstone National Park is that it will mean quite a drive, no matter where we fly into. Re: high prices, I imagine it becomes a sort of “death spiral” – when crowds go down, they probably have to raise prices just to stay afloat. It’s sad, really. I do think you’re right about the middle class keeping everything going. I read a story in the Washington Post recently about how Apple pays only 2% tax because they use all these legal tax shelters and loopholes. Similar story for other big companies such as Google too. It wouldn’t be so infuriating if we didn’t keep reading about all these 30-year-old billionaires. Sometimes it seems as if we’re back to the days of the Gilded Age.